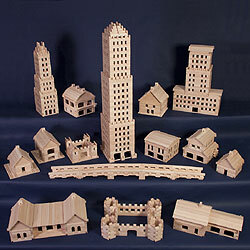 The Peters' Group offers you a better-designed building block system using solid wood blocks for enhancing playtime building fun. Stack & Stick™ blocks are uniquely designed to stick in place when applied in a stacking configuration. Slight downward pressure is all that is required to hold each block into place. Creative play is improved because each block fits snugly together insuring greater stability and a sturdy base makes travel from room to room easy. Just try this with other conventional building blocks. Each set of Stack & Stick™ blocks is proudly manufactured in the United States. We use only select hard maple lumber which has been properly harvested from timber lots in the U.S.A. Stack & Stick™ is a product of three generations of skilled woodcraftsmen in the Peters family. 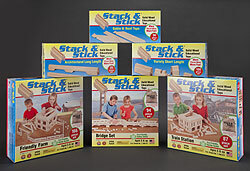 Click here to see some of the newer products Stack and Stick has shared with ToyDirectory and TDmonthly Magazine.